FROM COPENHAGEN TO CANCUN- A PATHWAY OF ERRORS THAT DISCREDITS THE UNITED NATIONS PROCESS; ONLY RECOURSE IS TO GO TO THE INTERNATIONAL COURT OF JUSTICE. On the first day, of the Conference in Copenhagen, Papua New Guinea had proposed that the parties strive for consensus with a fall back on 75%; the request was summarily dismissed by the chair. This voting mechanism was proposed to prevent the conference from descending to the lowest denominator. The proposal was justifiable given that the UNFCCC was adopted by 79% of the UN states at the time. Unfortunately, if there had been a fall back on 75 %, there would probably have been a legal agreement with some firm commitments; an agreement supported by most the G77 group –representing over 130 states, along with developing states not members of the G77, and along with many state members of the European Union. Clearly, this potentially legal agreement would not have been endorsed by the US and other major greenhouse gas emitting states; but it could have been used, both ethically and legally at the International Court of Justice, to point out how the major greenhouse gas emitting states, signatories of the Convention have continued to fail to discharge their legally binding obligations under the UNFCCC, including- Article 2, along with other key principles of the Convention . In Copenhagen, Bolivia was seriously respecting the emerging science, adhering to principles in the UNFCCC and addressing the urgency by demanding that the temperature not rise above 1 degree, and the parts per million must return to 300 ppm. December 8, 2009, Press Conference. At the formal press Conference of the Secretariat, I raised the issue of the dismissing of Papua New Guinea’s proposal of a fall back of 75%. During several prior press conferences every one lamented that there would not be a legally binding document because the US had not been authorized by Congress to enter into a legally binding agreement. At above press Conference of the Secretariat, I asked Yvo de Boer Executive Secretary of the UN Framework Convention on Climate Change, whether it would not be better for there to be a legally binding agreement among 75% of the states and the US and other states could list reservations. Secretary De Boer answered that the US had to be part of the agreement, and I added that there was a precedent where the US was not part of the Convention on the Law of Treaties and entered a reservation. Obviously not all states are perceived to be equal. So much for the principle of the sovereignty of states in the Charter of the United Nations! What happened instead at Copenhagen was a striving for consensus with a fall back of around 10% if not 5%; the Copenhagen Accord drafters ignored the pleas of the developing states, not even accommodating common concerns but only the concerns of the major greenhouse gas emitting states. At Copenhagen, in the middle of the night there was the “We have a deal” edict coming from President Obama flanked by American flags. This `deal` `affirmed the limit of 2 degrees, and contained modest and insufficient pledges to reduce greenhouse gas emissions. It is clear that this edict was an affront to the UN multilateral process, to the procedure of consensus and to the majority of the member states of the United Nations - most of whom were calling for the temperature to not rise above 1.5 if not 1 degree. Not only was it an affront to the UN and to the majority of states but also to principles within the UNFCCC and to peremptory norms within the UN system. Immediately after Cancun, the developing states that refused to take note of the Copenhagen Accord should have declared that Take-note Copenhagen Accord to be null and void under Article 53 of the Vienna Convention on the Law of Treaties. Under Article 53 of the Convention on the Law of Treaties, treaties conflicting with a peremptory norm of general international law (jus cogens) are null and void. "A treaty is void if, at the time of its conclusion, it conflicts with a peremptory norm of general international law. For the purposes of the present convention, a peremptory norm of general international law is a norm accepted and recognized by the international community of States as a whole as a norm from which no derogation is permitted and which can be modified only by a subsequent norm of general international law having the same character." These norms are derived from instruments that guarantee human rights including social, economic and cultural rights, civil and political rights, labour rights, women’s rights and indigenous rights; that ensure social justice, that protect and conserve the environment, move away from the overconsumptive model of development and reduce the ecological footprint and that prevent war and conflict. It could have been argued at the ICJ or the Chamber on Environment Matters in the ICJ, that the Copenhagen Accord by failing to substantially address the necessary measures to prevent dangerous anthropogenic interference with the climate system, the Accord would contravene Article 2 of the UNFCCC. In addition the Accord would contribute to the violation of numerous peremptory norms affirmed through years of United Nations negotiations of legally binding treaties, conventions and covenants, conference action plans and declarations and resolutions. And under Article 53 of the Vienna Convention on the Law of Treaties, an agreement would be declared null and void if it violated international peremptory norms. After Copenhagen, President Morales, understandably upset with the US ignoring the pleas of the developed states, decided to hold another process in Cochabamba - a process that would enable open interaction among states, civil society and indigenous peoples. The powerful People’s Agreement which emerged from the April Conference in Cochabamba was endorsed by over 35,000 representatives of civil society, indigenous peoples and some governments. During the year, Pablo Solon, the Bolivian Ambassador to the UN, participated in numerous UN processes under the UNFCCC, and valiantly struggled to include the conclusions of Cochabamba People`s Agreement in the negotiating documents. In August, Ambassador Solon reported after the climate change conference in Bonn, that proposals from the Cochabamba/Peoples Agreement are still in the negotiating document. Similarly, Ambassador Solon reported that that many of the key proposals from Cochabamba were still in the agreed to text negotiated in China. Throughout the year there were these closed ``meetings outside the UN process where the pro-Copenhagen Accord forces were excluding states, (e.g. REDD meeting in Norway) that had not taken note of the Copenhagen Accord from participating or they were cajoling, coercing or using cheque book diplomacy to encourage developing states, especially vulnerable states, (e.g. vulnerable states meeting in Kiribati) to take note of the Copenhagen Accord. In Kiribati,the most vulnerable states were induced, most likely by the participation of the US, Canada, Japan, Australia and Great Britain, to agree to take note of the Copenhagen Accord in the Ambo Declaration. The intent behind the pressure on the most vulnerable was to agree to create a legal binding document out of the Copenhagen Accord, to in essence ignore a second period of Kyoto commitment, and essentially undermine the principles in the UNFCCC. The building in Cancun on the Copenhagen Accord discredits the United Nations by compromising on science and principle and by undermining the UNFCCC. Yet the Cancun UNFCCC website prominently displayed the Copenhagen accord. ``Conference of the Parties (COP), at its fifteenth session, took note of the Copenhagen Accord of 18 December 2009 by way of decision 2/CP.15. The text of the Copenhagen Accord can be found here. Albania, Algeria, Armenia, Australia, Austria, Bahamas, Bangladesh, Belarus, Belgium, Benin, Bhutan, Bosnia and Herzegovina, Botswana, Brazil, Bulgaria, Burkina Faso, Cambodia, Canada, Central African Republic, Chile, China, Colombia, Congo, Costa Rica, Côte d'Ivoire, Croatia, Cyprus, Czech Republic, Democratic Republic of Congo, Denmark, Djibouti, Eritrea, Estonia, Ethiopia, European Union, Fiji, Finland, France, Gabon, Georgia, Germany, Ghana, Greece, Guatemala, Guinea, Guyana, Hungary, Iceland, India, Indonesia, Ireland, Israel, Italy, Japan, Jordan, Kazakhstan, Kiribati, Lao People's Democratic Republic, Latvia, Lesotho, Liechtenstein, Lithuania, Luxemburg, Madagascar, Malawi, Maldives, Mali, Malta, Marshall Islands, Mauritania, Mexico, Monaco, Mongolia, Montenegro, Morocco, Namibia, Nepal, Netherlands, New Zealand, Norway, Palau, Panama, Papua New Guinea, Peru, Poland, Portugal, Republic of Korea, Republic of Moldova, Romania, Russian Federation, Rwanda, Samoa, San Marino, Senegal, Serbia, Sierra Leone, Singapore, Slovakia, Slovenia, South Africa, Spain, Sweden, Swaziland, Switzerland, The Former Yugoslav Republic of Macedonia, Tonga, Trinidad and Tobago, Tunisia, United Arab Emirates, United Kingdom of Great Britain and Northern Ireland, United Republic of Tanzania, United States of America, Uruguay, Zambia. Afghanistan, Angola, Antigua and Barbuda, Barbados, Belize, Brunei Darussalam, Burundi, Cameroon, Cape Verde, Chad, Comores, Gambia, Guinea-Bissau, Honduras, Jamaica, Kenya, Liberia, Mauritius, Mozambique, Nigeria, Saint Lucia, Timor-Leste, Togo, Uganda, Ukraine, Viet Nam. But does support gained through devious means bestow legitimacy? After careful manipulation, the Copenhagen Accord is given value because it has potentially 70% adherents. This practice of post bestowing post-coercion legitimacy is discrediting the UN. The original fact that the Accord was imposed by a few - the major greenhouse gas emitting states - on the many - the developing and most vulnerable and least developed states - rather than the many -– the developing the most vulnerable and least developed states –requiring the few that are the primary contributors to greenhouse gas emissions to act -IS LOST. Given that it is the major greenhouse gas producing states that have been primarily responsible for climate change should it not now be the 75% of the states - the least responsible and most affected to determine what should be done to attempt to address the urgency of the climate change. And then invite others to join. In Cancun, Dr. Molino opened the conference and made a statement that undoubtedly was intended to give credibility to the Copenhagen Accord; he stated that 100 state leaders had agreed that the temperature should not rise above 2 degrees - coincidentally the message in the Copenhagen Accord. Either he was not at Copenhagen or he did not pay attention to the pleas of the developing states representing140 states. The majority of the developing states were calling for the rise in temperature to remain below 1.5 degrees and some states were demanding that the temperature should NOT rise above 1 degree. Subsequently, there was a US press Conference by Dr Pershing, the head of the US delegation and after the US press Conference, I told Pershing about my conversation with Dr Molina. Pershing then engaged in ad homonym critique of Molina, and then I said, ``Science should never be compromised. `` His handlers took him away. compromise to a new level and proclaimed that compromise is an act of wisdom. Emerging science clearly indicates that the 2 degrees threshold in the 2007 IPCC report which was based primarily on 2004 and 2005 data is no longer deemed to be scientifically valid. And that in order to honour and operationalize the firm obligation in Article 2 of the UNFCCC-to prevent dangerous anthropogenic interference with the climate system- states must implement stringent measures to keep the rise in temperature below 1 degree Celsius. Science and principles cannot be compromised because the major greenhouse gas emitters will only agree to maintain the temperature just below 2 degrees, because they refuse to operationalize the principles of the Convention and because they renege on obligations related to the Kyoto Protocol. All references to the Tjanin negotiated text and to proposals from Bolivia and the Cochabamba People’s Agreement have vanished. The question has to be answered if the UNFCCC COP process is going to have any credibility. Why is the Chair of the Conference given the power to remove brackets and defy the UN Negotiating process? I tried to ask at EU press conferences how they would be incorporating the decisions of the Cochabamba Accord into the negotiations? But I was not acknowledged because I had already asked a question the day before. I attended Bolivia’s Press Conference on November 30 and asked Ambassador Solon a question: ``In the event that the Cochabamba proposal to have an international tribunal were not put back into the negotiating text would he be prepared to join with other developing states to take the major greenhouse gas emitting states to the International Court of Justice?`` He indicated that there had been some discussion. Compromising science is not wisdom and equally compromising principles is not wisdom. 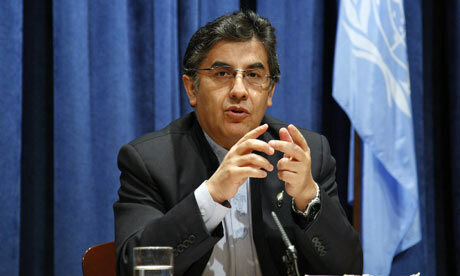 Throughout the Chair`s text there is a call to abide by principles in the UNFCCC Convention. In the UNFCCC are the intergenerational principle, the common but differentiated responsibility principle, and the precautionary principle. The essence of the intergenerational principle is “to protect the climate system for present and future generations” ; the rights of future generations will be violated if the global community fails to act now by committing to strong and immediate reductions on greenhouse gas emissions. To prevent the devastating impacts of climate change a recent report from UNEP indicated that the pledges in Copenhagen would not even be sufficient to contain the rise in temperature to 2 degrees. The chair`stext only reifies the pledges in the Copenhagen Accord, which the UNEP report indicate would achieve only 60% of the necessary greenhouse gas emissions necessary to prevent the rise in temperature above 2 degrees. The perpetuation of the inadequate pledges undermines the intergenerational principle. When the report was referred to at the EU press conference, I asked how is it possible then that in Cancun, there seems to be acceptance of the inadequate pledges in the Copenhagen Accord. “States shall cooperate in a spirit of global partnership to conserve, protect and restore the health and integrity of the Earth’s ecosystem. In view of the different contributions to global environmental degradation, States have common but differentiated responsibilities. “ (Principle 7, Rio Declaration) If this principle were seriously operationalized to respect the major greenhouse gas contributions of the major greenhouse gas emitters, the percentage of greenhouse gas emissions would be mandatory and considerably higher than in the Copenhagen Accord. In this text the Chair reintroducing the bracket sections related to `Degrees - 1 1.5 and 2. While the Chair reintroduced the bracket section on the temperature rise, she did not re-introduce key Tjainin bracketed section, such as establishing an international Tribunal. I attended the press conference given by President Rafael Correaof Ecuador, and asked him : In the event that the proposal from the Cochabamba conference of having an international tribunal set up was not in the Cancun text, would he be prepared to join in with other developing states in taking the most egregious greenhouse gas emitting states to the international court of Justice for failing to discharge their obligations under the UNFCCC and the Kyoto Protocol. He responded that there had been some discussion about that. Prior to the release of the final text, I attended a press conference given by Bolivia, by the Chair of the African Caucus and the Chair of the least developed states. They were not able to comment on the final text as it had not yet been released. The representative from the African Caucus stated that the decisions must be based on science and the law. I asked if he thought that the current negotiations were based on science and law if the negotiators were using the 2007 IPCC report based on data from 2004 and 2005 and the ignoring the emerging science, reported by IPCC representative at Copenhagen, that at 2 degrees the poor, the disadvantaged, and the vulnerable would not survive, and at 1.5 degrees they might. Throughout the conference there were press conferences lauding a million here and a million there bestowed on vulnerable and least developed states instead of firm commitments to substantially reduce emissions to prevent the dangerous anthropogenic levels as required in Article 2 of the UNFCCC. At one of these press conferences, I raised the issue of this being conscience money, perceived to give legitimacy to developed states to do nothing. On the final day Achim Steiner, the head of UNEP was on a panel with yet another magnanimous offer of a few million. He indicated that there were really two summits: The first was the negotiating process and the second one were the agreements to fast track funding to help. I asked if he thought that the second summit offset the pressure on the first summit to seriously reduce emissions. He responded that he disagreed and thought that the Summit II would motivate Summit 1 to move further. I am not convinced! Late in the Afternoon, the chair`s text was finally released. This text was intended to be the final negotiating text – again 1 and 1.5 was removed leaving only the limit of 2 degrees with some reference to 1.5 down the road taking into consideration of science. The Chair had cobbled up recommendations from the various working groups for the final text. Plenary called and states were given two hours to review the text. When they returned, concern was justifiably expressed by Bolivia, but most states applauded themselves for such a successful negotiated text. And the chair ruled that consensus could not be blocked by one state and that Bolivia concerns would be noted as a reservation. NOTE THE SELECTIVE TREATMENT IF THE US HAD NOT AGREED THE AGREEMENT WOULD BE BLOCKED. Bolivia is also justified in seeking redress for the abuse of UN process by not only the major greenhouse gas emitting states but also by the Chair. In addition the proposal by Bolivia and in the People Agreement from Cochabamba to institute an International Tribunal under the UNFCCC is no longer in the current Cancun Agreement. This leaves no other recourse for Bolivia and other states but to launch cases in the ICJ or in the Chamber on Environmental Matters against the egregious greenhouse gas-producing states that are signatories of the UN Convention on Climate Change, and its Kyoto Protocol. Given the urgency of the issue of climate change and the reluctance of the major Greenhouse gas emitting states to act, there could be a justifiable case of Criminal negligence. In the apparent absence of an international definition of what constitutes criminal negligence, there appears to be common components within national statutes of what constitutes criminal negligence. Canadian common law provides useful guidance because Canada has a system of law drawn from both the Common Law and the Civil Code systems. Under Canadian law “Environmental negligence” suits focus on compensation for loss caused by unreasonable conduct that damages legally protected interests. Unreasonable conduct means doing something that a prudent or reasonable person would not do, or failing to do something that a reasonable person would do. The plaintiff must establish certain key elements of the tort — cause in fact and proximate cause, damages, legal duty, and breach of the standard of care. Note that fault may be found even in the case of unintended harm if it stems from unreasonable conduct. The Criminal Code (Section 219) is even clearer that lack of intent to harm is no defence if damage results from conscious acts performed in careless disregard for others: “Everyone is criminally negligent who (a) in doing anything, or (b) in omitting to do anything that it is his duty to do, shows wanton or reckless disregard for the lives or safety of other persons” (where ‘duty’ means a duty imposed by law). Significantly, Section 222(5) (b) states that “a person commits homicide when, directly or indirectly, by any means, he causes the death of a human being, by being negligent (emphasis added) (Cited by Bill Rees in his piece “Is Canada criminally negligent”). The ICJ should also be asked for an advisory opinion on the extension and application of the transboundary principle to failure to take seriously the responsibility to not harm other states though the greenhouse gas emissions arising in Nation states. The lack of intent to harm may not constitute a defence if damage results from conscious acts performed in careless disregard for others: The basis of the evaluations should be that “Everyone is criminally negligent who (a) in doing anything, or (b) in omitting to do anything that it is his duty to do, shows wanton or reckless disregard for the lives or safety of other persons” (where ‘duty’ means a duty imposed by law). Having International Court declare the Cancun Agreement null and void. There was an opportunity in Cancun to be replace “the take note“ Copenhagen Accord with a legally binding Cancun Protocol based on credible emerging scientific and institutional data and on the principle of differentiated responsibility and not on the vested economic interests of the fossil fuel emitting corporate states. Unfortunately, this did not materialize. It is clear that the year-long process of coercing reluctant states to adopt the Copenhagen Accord unfortunately worked. Sadly, not only the pleas of the most vulnerable states but also the emerging science and fundamental peremptory norms and principles were ignored. Thus the Cancun agreement must be deemed null and void, under Article 53 of the Vienna Convention on the Laws of Treaties. In addition the UN General Assembly could invoke Article 22 of the Charter of the United Nations, and set up an international tribunal to investigate the states that continue to engage in practices which will cause the global community to reach the dangerous anthropogenic level of interference with the climate change. Major greenhouse gas-producing states must be legally forced to implement the actions that would discharge the obligations incurred when they signed and ratified the UNFCCC. In addition, historic emissions should be calculated and an assessment made of the degree of dereliction of duty in the implementation of the UNFCCC. From these assessments, provisions must be made to compensate the states that have been most damaged by the failure to discharge obligations under the Convention (the climate debt). In such cases, a fund should be set up to assist vulnerable states in taking delinquent states to the International Court of Justice. These resources should be put into a fund for the Implementation of the UNFCCC; and the proposal in the Peoples Agreement from Cochabamba of setting up of an international Tribunal to process states that have consistently failed to discharge their obligations under the UNFCCC and the Kyoto Protocol. The International Criminal Court should be able to extend its jurisdiction to cover crimes against humanity resulting from irreversible consequences of climate change.